The K index started out at a 3, and by the time the FMT was over on Thursday morning it was up to 4. The comments verify, this made for poor FMT conditions. The distance award this FMT goes to JF1VRU, and 7L4IOU, both in Tokyo. Shintaro copied the 40 meter run, and Hisami copied the 160, 80, and 40 meter run. *note that W3JW had three 10 millihertz readings! ** WA1ABI, N7EP, and W9TJ had two 10 millihertz readings. N8OB OH It wasn't my evening on the radio. No 20M signal at all and I couldn't lock in on 80M. W2FD WPA Thanks to both of you for your efforts. Noisy band conditions on most bands and very weak 20 M. signal here. W6OQI LAX K5CM was S8 while aiming east and S9+10 while aiming west on 20 meters, S2 on 40 and S5 on 80 meters. There was the usual Doppler movement plus some extra on 40 meters. JF1VRU DX I am using TS-830 + Home brew Digital VFO. Thank you. W9ZB IN 7MHz and higher were just about dead here by 11:00 EDT. 160 was open, but didn't copy anything here from the 5 call area. The 3.5 and 7MHz morning runs were more readable, but with heavy QSB and phase shifts. A challenge, but thanks for the fun, Connie. KØMZ KS Thank you Connie and Marvin. The first 20 meter signal was not heard. The second was just below noise level so my reading is probably way off. The 40 meter signal was at noise level. The 80 meter signal was 20 over S-9. West Coast 40 meter signal was just above noise level. 80 meter signal was S-7 to 20 over. Next morning 160 meter signal was very strong, 40 over. 80 meters was also 40 over. 40 meters had doppler with a signal strength of S-5. N3FG EPA No signal heard on 20M. TNX agn for a fb event. W4AVO VA No sig on 20 or from Calif. IC756p3 + SL2.7b20. Tnx Connie. W9TJ IL My 20 mtr is a WAG. No identification either east or west but west sig hit a few short bursts. 40 mtr S9+30 some doppler short quick fades with phase run. 80 mtr S9+30 short quick fades with phase run. West coast sigs vy poor with 40 there abt 40% and 80 abt 20% copy. Thursday sigs were all good with doppler and phase run on 80 and 40. Thank you again for the chance to participate. K5CM OK Good signals on 80 meters, but Marvin's 40 meter signal just happened to be on some sort of digital noise source. Still came up with a reading. Thanks for the West Coast run Marvin. K6APW/7 OR Strongest signals K5CM on 40M and W6OQI on 80M, weakest W6OQI on 40M, in and out of my noise. Slightly modified correction algorithm, maybe better, maybe worse, certainly different, with decimal point calculations way past reason! K7TT WWA 80M had very high noise here ... and couldn't find the signal on 160M run 2 here. 20M was a strong signal here. 20M West was better but just slightly over your East signal. A lot of what I guess is atmospheric movement of the signals making it necessary to use averages. KD2BD NNJ Connie's 80 meter signal was quite weak with frequent fades during the evening run. The Kp index at the time was 3. It had been hovering around 0 for several days before the FMT. Talk about timing! I stayed up for Marvin's transmission, but didn't copy it. Consider my entry a ballpark measurement due to the weak signal conditions. KA1BQP RI Very weak signals except the 40 am run. No copy at all on 160 or 20. I had to rely on spectrum lab for the two west coast runs as well as 80 am. Tnx Connie and Marvin. N7EP WA One of the more difficult FMT's. Lots of doppler and weak signals. I'll be pleased to be within 0.5 Hz on any of the frequencies. W3JW VA Good signals on all runs except 20 meters. AT first I saw no signal at all on the 20 meter run. 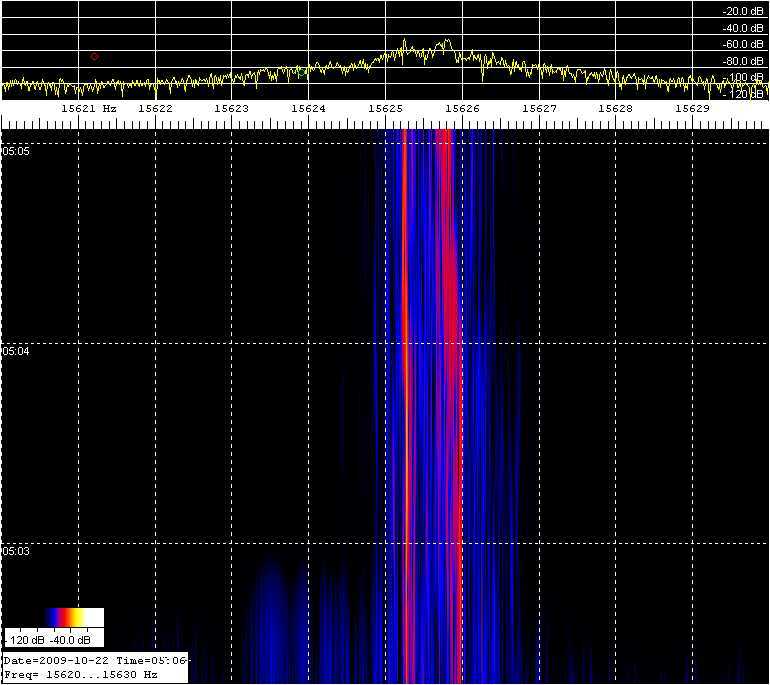 Changed over to my inverted-L antenna and picked up the faintest trace I think I have ever seen on Spectran. By then you were into the continuous carrier part of the transmission and it went away at the right time (as you rotated the beam)--- there was no possibility of a CW identification at the level I was receiving. AF9A IN Connie, pretty good signals on 80m (Wed. night). Heard nothing on 20, only a couple CW characters from your call on 40. K1GGI EMA Nothing heard on 20, the best sigs were only S5 or so. Nothing heard on 160 either, but took a chance and recorded a few minutes, and Spectrum Lab found something. Wonder what it was. Anyway, another fun fmt. Thanks Connie and Marvin. 7L4IOU DX Hi Connie Reports are took up from the Waterfall. There is no proof, it was not Audible except 40M. I will try again at next run. Than you very much! 73 Hisami sri 20M wev file was clashed. 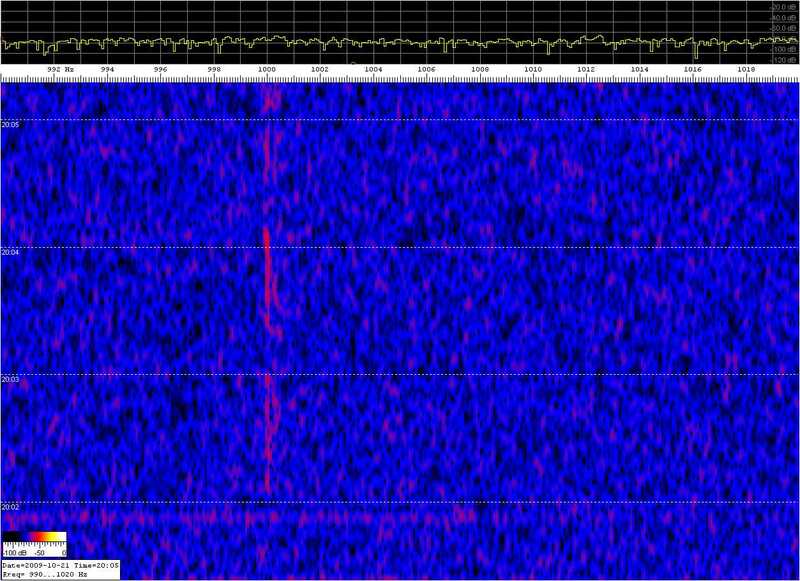 Spectrograph of K5CM'S Thursday morning 40 meter signal as copied by K6OQK in LAX. 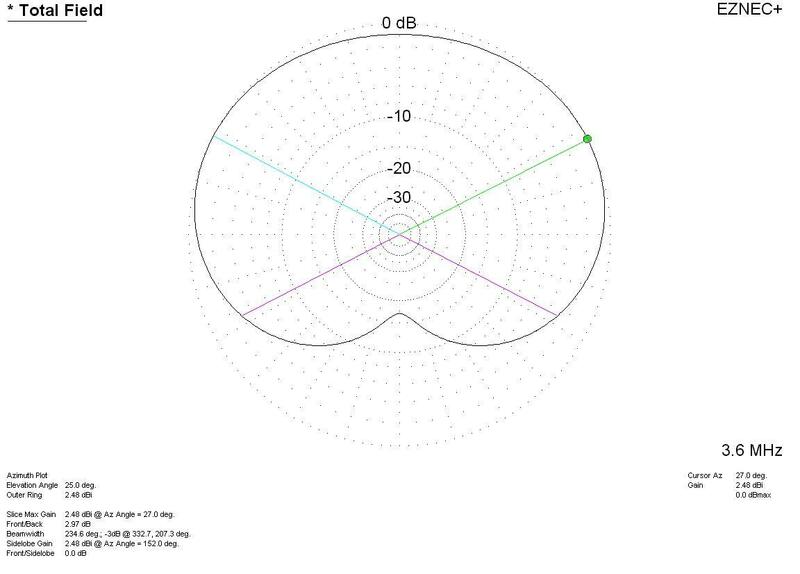 15625 is 7079211 Hz. Notice the interesting double peak. Note that Burt's method is frequency reversed. Spectrograph of K5CM's Thursday morning 80 meter signal as copied by K6OQK. 15625 is 3579186. Again, notice the double peak. Frequency are reversed. Spectrograph of W6OQI'S 40 meter signal as copied by K7TT. Spectrograph of K5CM'S 160 meter signal as copied by 7L4IOU in Tokyo. A HP Z3801 GPS frequency source clocks a HP-3336B. A 10 db transistor amp follows and drives a 12BY7 / pair 6146. Then to the final amplifier, a Dentron 2500 running 300 watts out on 80, 40, and 20 meter AND 500 watt out on 160 meters. There are no mixers or any device in the chain of amplifiers that might impact the accuracy of the GPS frequency source. As a reality check, I periodically log the frequency source against WWV and other GPS referenced sources. I monitor each transmission with a completely separate receive system to look for any instability or short term drift. The separate system is not locked to the GPS transmitting system, but to another GPS source. I typically see considerably less than 1 mHz difference at 10 Mhz when comparing two Z3801's over a 10 second period. 160 - Sloping dipole form top of 170' tower. Favors East, West, and North. My Transmitting setup consists of a HP Z3801 clocking a HP 3336B which drives a Johnson Viking I transmitter, the output of which is attenuated by a 6 db attenuator, to then drive an Icom PW-1 amplifier to about 500 watts. The antenna is an inverted Vee which favors north and south from the Los Angeles area. Note: Because I put the results up quickly, there will be mistakes, so don't hesitate to point them out quickly.